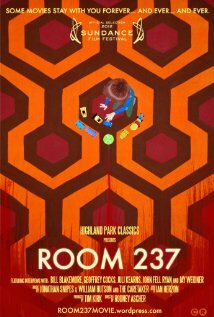 I was just going to ignore this commentary of Stanley Kubrick’s films called “Room 237” but I just can’t. For your sake! Don’t ever watch this garbage unless you are the type into far-reaching conspiracy theories that have no, or very little, basis for facts. I am a huge fan of Stanley including The Shining, and much of his work, but this dude that made this commentary puts him on a pedestal like he could do no wrong. Truth-is that Stanley was a great movie writer and creative (no doubt), but this commentary-dude goes severely overboard. This whole movie is so dramatically overboard on the ‘meanings’ of the movie when in reality the narrator offers few facts (only opinion). What is pretty cool about this narration is that it has a lot of good movie footage from many of Kubrick’s films overall, not just The Shining. And while many of the far-out suggestions were way too radical, I must admit a few were worthy of a consideration. Bottom-line, if you like Kubrick you will hate this narration, or if you don’t like Kubrick you will be confused and most likely hate it worst so my advice is adhere to my low Steelers-Star ranking advice of two stars and avoid this Stanley “2001 Space Odyssey” Space Junk of a film.